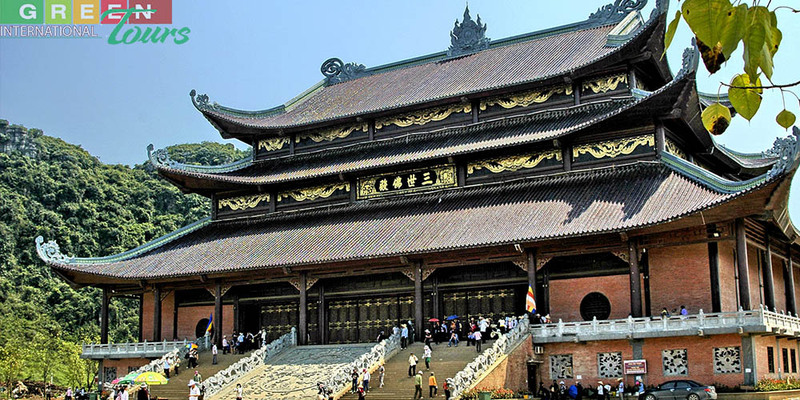 07:40 – 08:30 Get picked up by our tour guide and bus at your addresses around Hanoi Center then depart for Bai Dinh pagoda and Trang an eco-tourism attraction area (120kms south of Hanoi). 10:30 Arrive in Buddha Sanctuary place of Bai Dinh Pagoda, the biggest one in Vietnam with 500 Arhan statues. You can see a biggest bronze Buddha statue in Vietnam with 10 meters in height, 100 tons in weight. Tour guide also gives you an introduction of beliefs and religions in Vietnam. 12:30 Have lunch in a local restaurant with some special dishes such as goat meat, pork storage vessel…. 18:30 Back in Hanoi, you get dropped off at your address. Tour ends.